Realising that someone close to you is becoming unwell can be a difficult time. You may question whether what is happening is part of the normal ups and downs of daily life or whether your relative is suffering from a mental illness. You may be right in either situation though it is better to consider all possibilities for your own peace of mind. This is also because the sooner you can get help for someone experiencing psychosis the better the outcome. If your relative has told you they are experiencing symptoms of psychosis or if you suspect that they are unwell this section tells you what you need to know about getting help. Who can I contact to get help? Your general practitioner (GP) is usually the first point of contact whether your relative is experiencing a physical or mental illness. Your GP will be able to assess your relatives mental state and consider whether they need to be referred to specialist services. Your relative may recognise that they have a problem and approach you about getting help in which case they can accept you advice and readily attend their GP. Sometimes though, your relative may not see the need for help even if you have expressed your concerns to them. You can contact your GP for advice and in some instances your GP may be able to do a home visit. It is important for the GP to be informed about exactly what your concerns are and it may be useful for you to provide them with this information. What if my relative is referred to specialist services? Your relative may be experiencing symptoms that your GP believes warrants further assessment. If so, your GP may refer your relative to the local community mental health services in order to conduct such an assessment and to consider whether your relative needs treatment. Community mental health teams are specialist teams with specific expertise in the area of mental health and offer a range of treatments and interventions that can be beneficial to your relative. DETECT is a pilot early intervention service that provides assessment for people who may be experiencing psychosis and specific treatments for those who definitely are experiencing psychosis for the first time within Cluain Mhuire, Elm Mount, Newcastle and St John of God Hospital services. 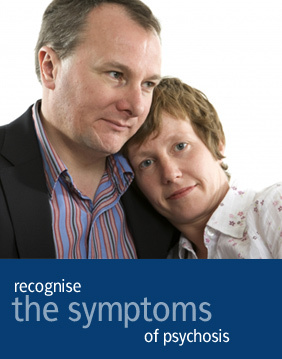 Are you concerned that someone close to you is becoming unwell? What can family and friends do ?